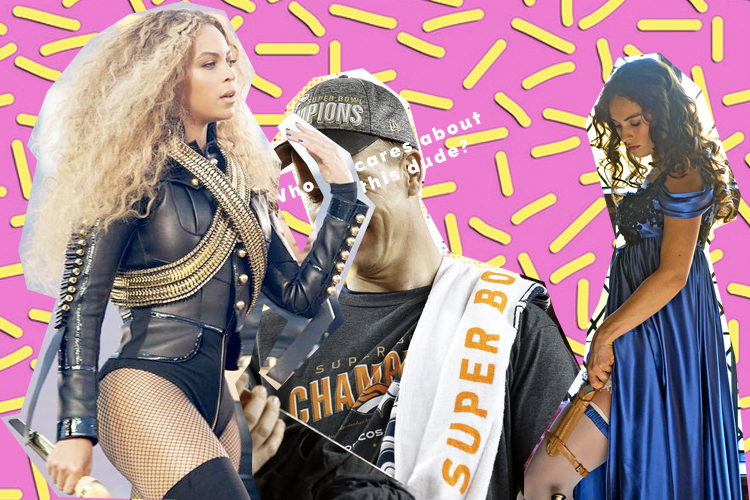 A lot happened this weekend in terms of pop culture, fashion, and awesome women. Let's talk about it! You might have heard there was a little sporting event this weekend. That's right, the Denver Broncos faced the Carolina Panthers in Super Bowl 50, aka the biggest sporting event in America and the reason that advertising execs live. I was more concerned about making the perfect guacamole to munch on rather than who won, but it was worth it to watch Lady Gaga sing the National Anthem and the Coldplay + Beyoncé + Bruno Mars (but really more like Beyoncé and Bruno Mars featuring Coldplay) halftime show. Gaga looked like vintage Dolly Parton with a mix of Effie Trinket for good measure in a custom red Gucci suit and towering heels. She crushed her performance, obviously, causing people to once again say they "didn't know Gaga could sing like that". Seriously, people? I thought we've established that Lady Gaga is an amazing singer by now and not just another pop diva. 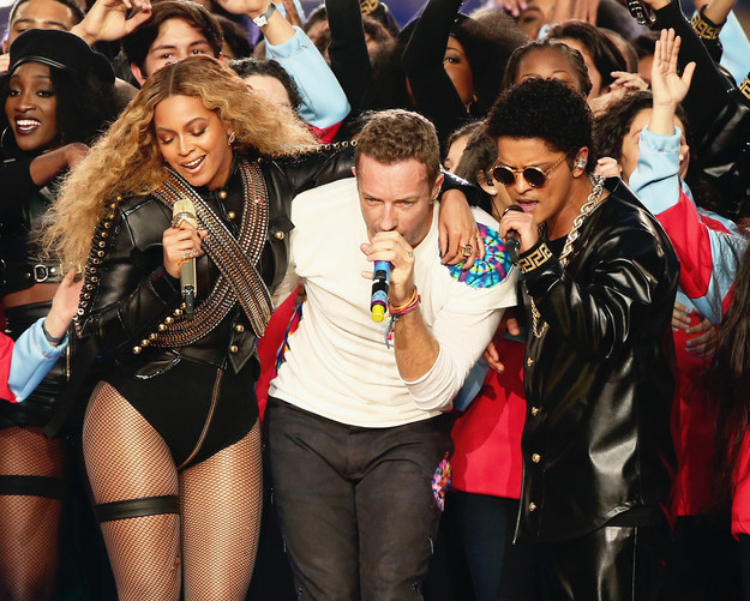 For the big halftime show, Coldplay went for a colorful rainbow theme while Beyoncé and Bruno Mars (plus their backup dancers) dressed in black and gold, with Beyoncé's outfit paying homage to the military jacket that Michael Jackson wore for his own Super Bowl performance back in 1993. I loved how colorful the overall production was, and how the entire stadium exploded into rainbow hues. Even though I was a little disappointed with the choice of Coldplay as the main performers, Bey and Bruno definitely made up for it. Before Beyoncé stole the spotlight at the Super Bowl, she released the music video to "Formation", and a Beyoncé music video always means some serious Fashion with a capital F. While the song isn't my favorite, I will admit that I loved the video. Shot in New Orleans, this video was a clear celebration of the hard-hit Louisiana city and black culture in general. Queen Bey surrounded herself with a posse of well-dressed individuals, from men in Mardi Gras masks to a group of natural-haired, Gucci-clad dancers, and intercut the video with footage of New Orleans life and scenery. I loved her all-black witchy outfit where she looks like she just became the next Supreme on American Horror Story: Coven, but my favorite scene has to be where Beyoncé and her ladies are sitting pretty in a Victorian drawing room, fanning themselves and setting a new bar for #SquadGoals. In addition to it being a great shot, it's also a brilliant reappropriation of a time where black people were horrendously mistreated. The whole music video is a feast for the eyes, with one look after the other absolutely killing it (the lyric "I slay" is completely appropriate, because yes, I'll admit it, Beyoncé does indeed slay in this video) but I hope people don't ignore the social justice message embedded within "Formation". The video references the "Black Lives Matter" movement and calls for an end to unnecessary police violence and racial discrimination. Even from a style standpoint, most of the women sport natural hair or other hairstyles like cornrows and braids, emphasizing that black hair and hairstyles are beautiful, instead of something to try and minimize or hide. It's great that Beyoncé recognizes how influential she is and how she has the power to enact huge change, and while we come to see her and her dancers get down and look fierce, I hope others recognize that the political message is more important than how #flawless Beyoncé looks. Of course, this is a fashion blog, so the clothes matter too! 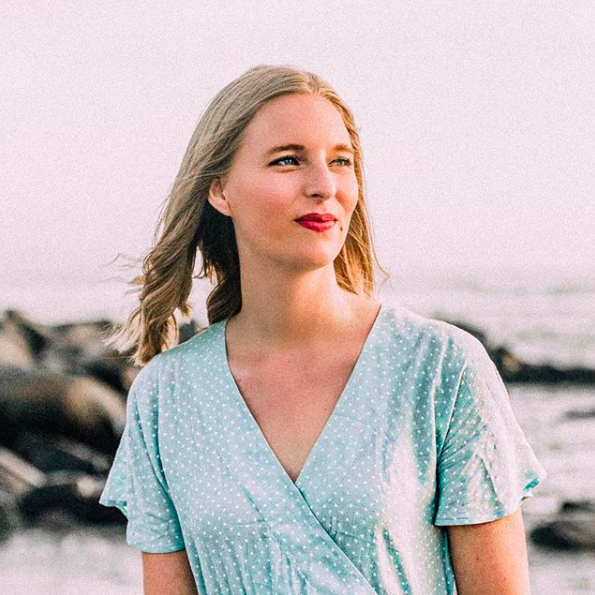 Racked has the rundown of all the looks. 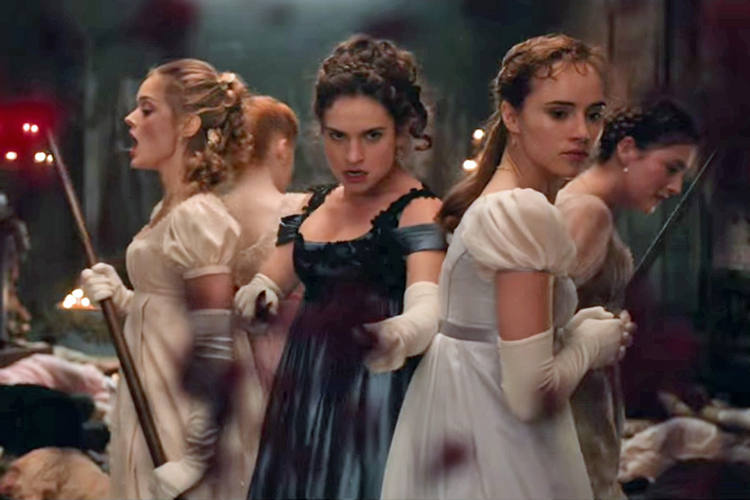 Speaking of women enacting social change with style, the Bennet sisters of Pride and Prejudice and Zombies are not quite the sisters you adored in the Jane Austen original. In addition to trying to find suitable husbands dealing with the strict rules of Regency decorum, Lizzy and her sisters have to occasionally battle the undead. It's a silly alteration to the romance classic that makes for a wonderfully entertaining film. I watched it on Saturday and found it way more enjoyable than I expected, since I'm not really one for zombies and horror. I think that's in part because PPZ is still very close to the original source material, with all the tension between Elizabeth and Mr. Darcy that I absolutely adore kept intact. If you're a fan of the book, you'll notice even the dialogue stays mostly the same, with some clever edits made to reflect the whole zombie thing (For example, the famous opening line, "IT is a truth universally acknowledged, that a single man in possession of a good fortune must be in want of a wife" becomes "It is a truth universally acknowledged that a zombie in possession of brains must be in want of more brains"). What I loved is that even in the midst of a zombie apocalypse, the English nobility agree that manners and traditions are still important, so the Bennet sisters still have to endure balls and the catty Bingley sisters in addition to zombies. 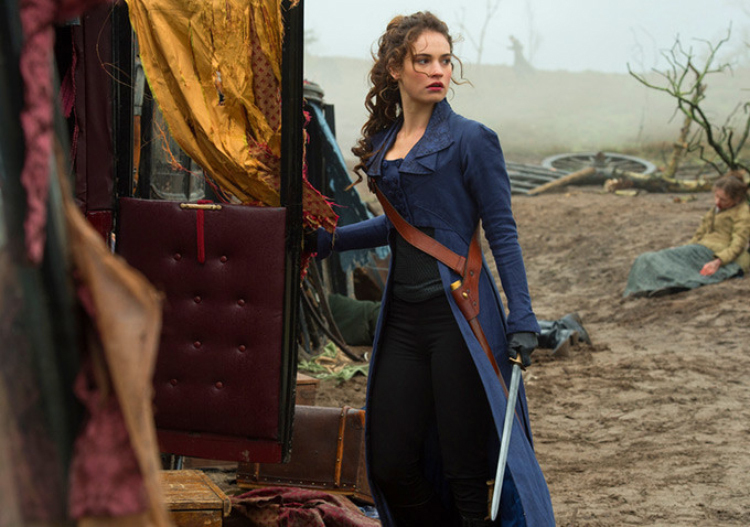 Because of this, the characters still dress in Regency era gowns and coats, but they stash knives in their garters and sling guns over their shoulders, just in case. 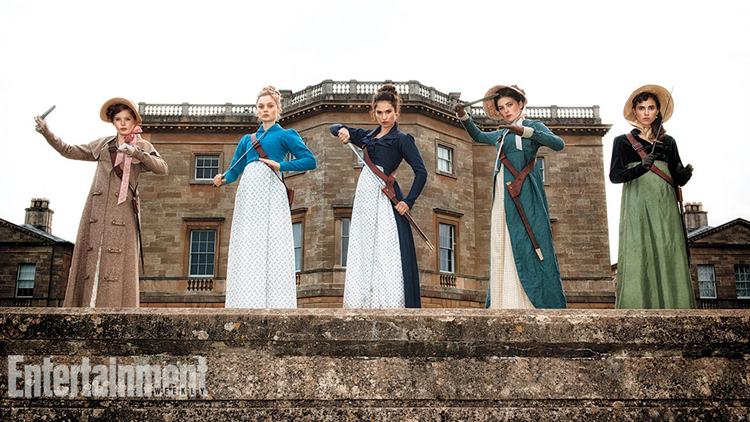 The premise of PPZ also demands more action than the Austen original, and it's great because the Bennets get more active roles in deciding their own fates. These girls are the definition of badass, and they don't need any boys to rescue them. What did you think of all the awesome fashion moments from this weekend? Let me know! I loved both the game and show, both were amazing! I loved Gaga's suit and if I had a valid reason to wear something like that, I totally would, haha! Thanks so much for sharing your thoughts and I hope you have a wonderful week ahead, beauty! Yeah, it was fun to watch! 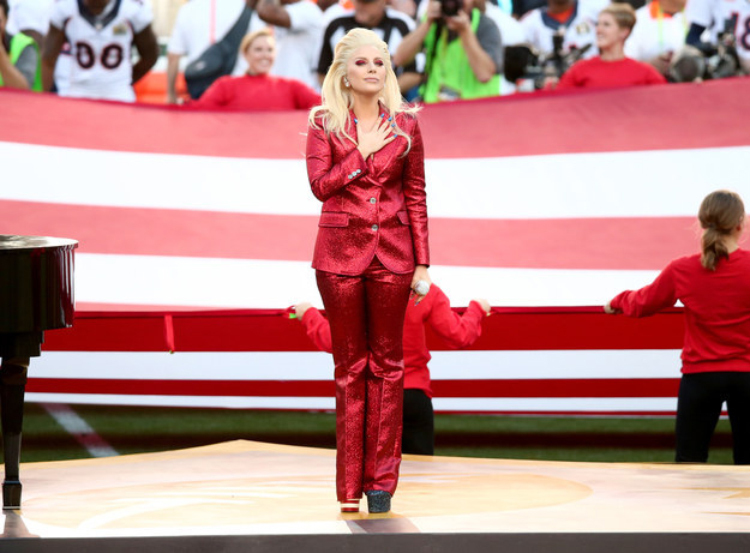 Gaga's suit was perfect for the occasion, I don't know if I could pull it off but it's totally fun! Thanks for reading, Jalisa, and hope your week is going well so far!